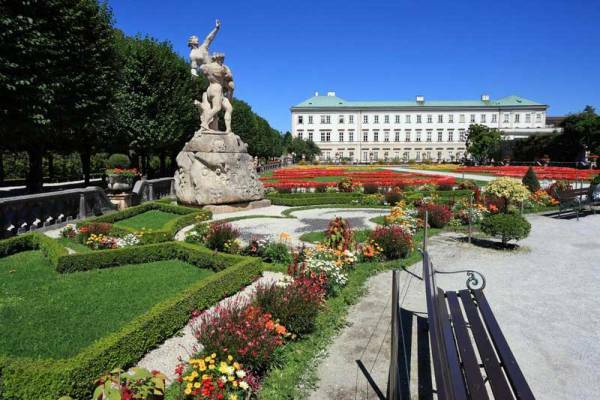 A great way to visit Salzburg is to start a Salzburg walking tour from the train station to Mirabell Palace. The walk should take you less than 15 minutes. 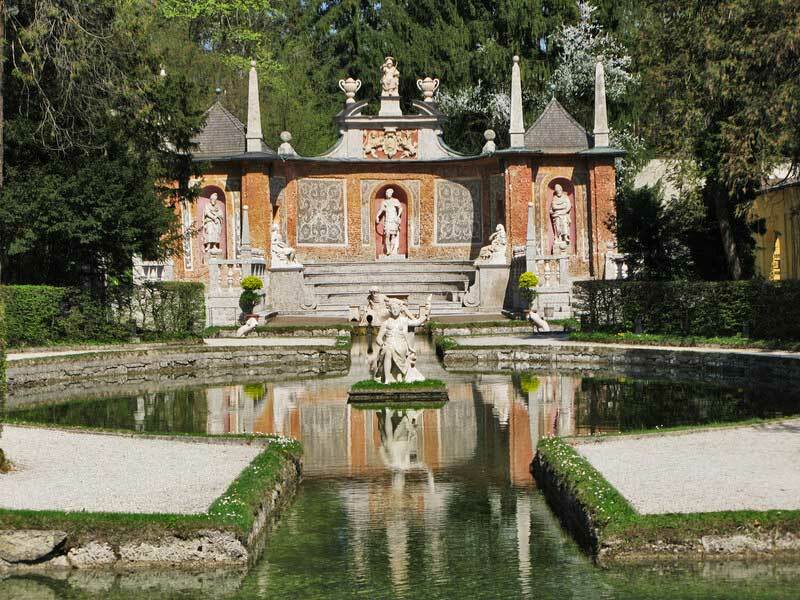 Mirabell Palace includes the Pegasus Fountain, Dwarves Garden, Hedge Theater and Rose Garden. The palace was one of the filming locations for the Sound of Music. Also in the Mirabell Palace area are a number of other attractions like the museum at Mozart’s Former Residence, the Holy Trinity Church, St. Sebastian’s Church and Cemetery and the Marionette Theater. The Marionette Theater plays classics by Mozart, Tchaikovsky and Shakespeare. At the Kapuzinerberg Monastery you can walk up the hill into fortifications from the early 1600s. 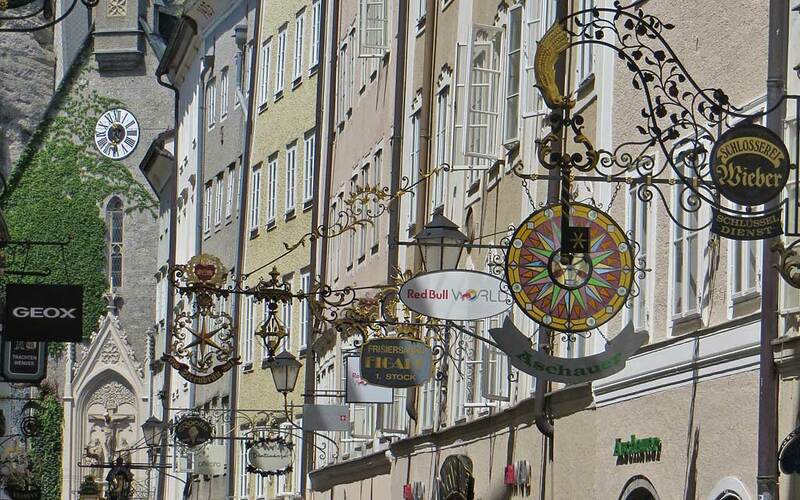 The Getreidegasse – “the street” where everyone congregates in Salzburg. It includes a museum at Mozart’s Birthplace (Mozart Gerburtshaus). Hohensalzburg Castle – one of the largest castles in Europe, with views over Salzburg. 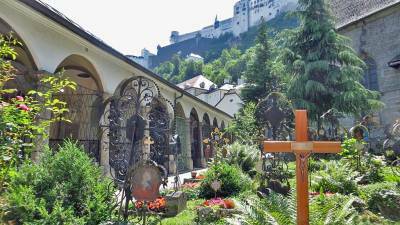 Take the funicular up to Hohensalzburg Castle from near St Peter’s. Salzburg Cathedral on the Cathedral Square. The Sphaera sculpture of a man on a golden sphere is a half block away. Right beside the Cathedral is Residenz Palace, which was the former Prince-Archbishop’s residence. The palace contains the Residenzgalerie of paintings. St Peter’s Archabbey with St. Peter’s Cemetery. Margaret Chapel is a small gothic building in St. Peter’s Cemetery. The Catacombs are located in the cliffs behind the cemetery. Dine within the Abbey walls at the oldest restaurant in Europe, Stiftskeller St. Peter, while listening to the music of Mozart. 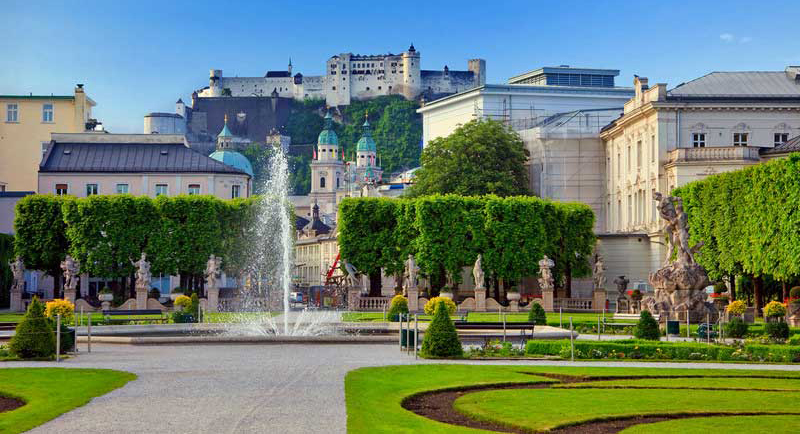 The Salzburg Festival House hosts the Salzburg Festival each summer and the Salzburg Easter Festival too. The Siegmundstor Tunnel (Neutor) – built in the 1760s to connect the Old Town to outer city districts, including Leopoldskron. The Horse Wash (Pferdeschwemme), a pond formerly used for watering and washing horses, is located at the Old Town end of the tunnel. 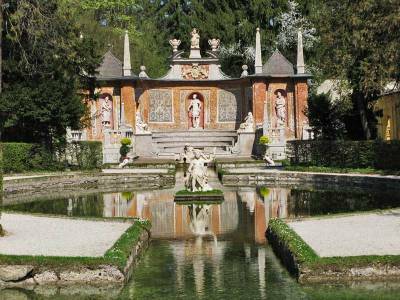 Hellbrunn Palace and its Trick Fountains are popular with tourists. Get drenched by a cherub in this water park that surprises visitors. 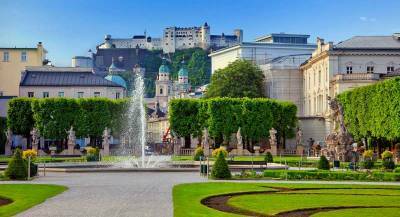 Sound of Music Tour – visit Salzburg Cathedral, Mirabell Palace and Gardens, Nonnberg Nunnery, Schloss Leopoldskron, the Marionette Theatre, the Hohensalzburg Fortress and the Hellbrunner Allee (Lane) on route to Hellbrunn Castle. The tour takes about 4 hours. Monchsberg – city park with city views. Take the Monchsberg Lift and visit the Modern Art Museum. Palace of Leopoldskron and the Freibad Leopoldskron Water Park. Red Bull Hangar-7 – a collection of airplanes, helicopters and Formula One racing cars. 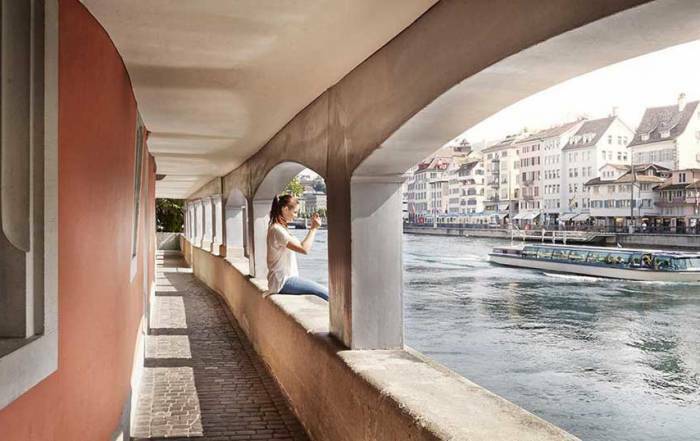 H+ Hotel Salzburg – a perfect location on the square facing the Salzburg train station and the main bus depot. The rooms are quiet, comfortable and reasonably priced. There is an international client base and customer service staff speak multiple languages. 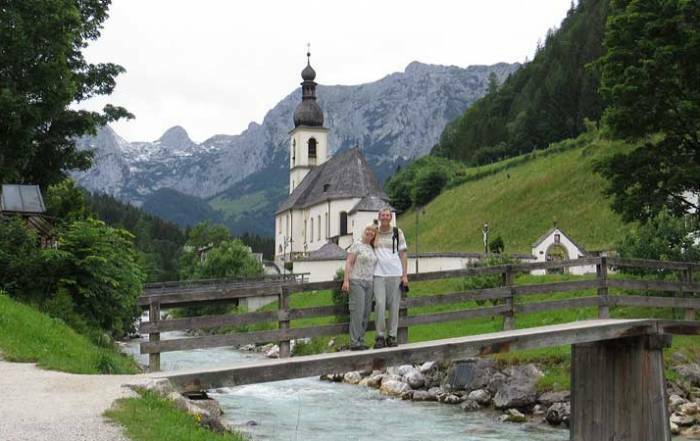 Travel less than an hour from Salzburg on bus #840 to the picturesque area of Berchtesgaden. See Hitler’s Eagles Nest, the Konigsee or the Berchtesgaden Salt Mine on your day trip Bechtesgaden Visit. 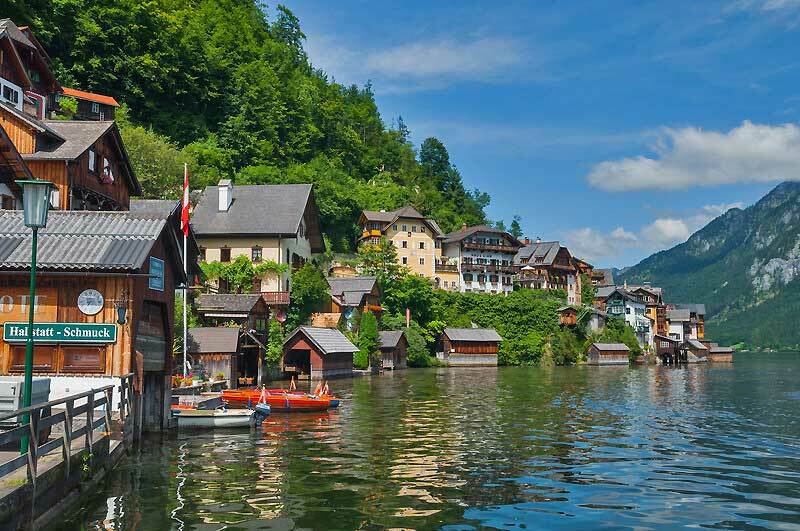 Take a day trip to the Austrian lake district, including Hallstatt, the Wolfgangsee and several other lakes less than an hour from Salzburg. Try an Austrian Lakes and Salt Mine Tour. Untersberg Mountain and Cable Car. The Ice Caves of Eisriesenwelt at Werfen are less than an hour south of Salzburg. Access is by cable car. There are over 30,000 sq metres and 42 kilometers of passages. It may be warm outside but it’s very cold in the caves. 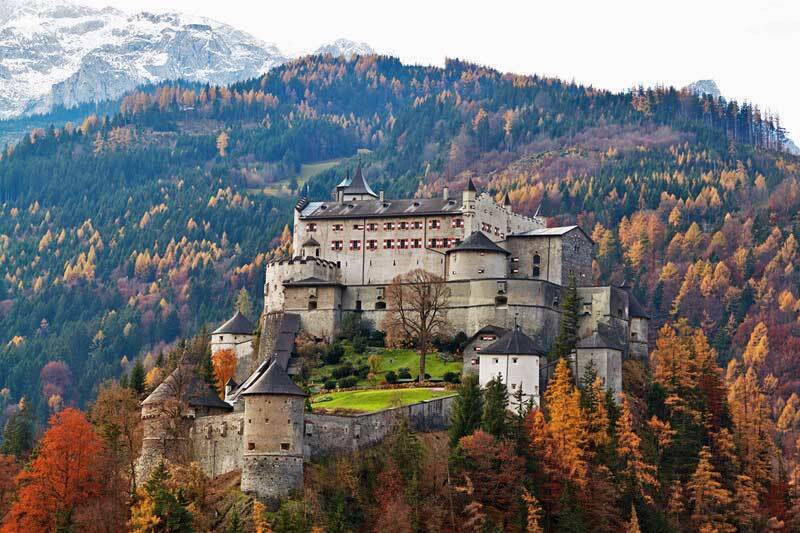 Also located here is Hohen Werfen Castle. 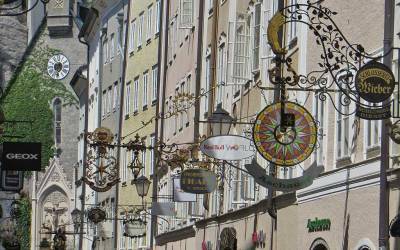 Salzburg was founded on the salt mine industry, so salt mine tours are very popular. You might often hear the phrase Salzkammergut which means ‘good salt chamber’. Options for Salt Mine Tours include Saltmine Berchtesgaden, Salt Mines of Hallein, Salt Mines at Hallstatt and Salt Mines at Altaussee. The Saltmine Berchtesgaden includes a salt raft ride and a train ride around the lake. The Hallein Salt Mine has a miner’s slide, a salt lake boat ride and a Celtic village. Try Mozart-Kugeln (a Mozart ball) – Pistachio and marzipan coated in milk chocolate. This was created in 1890 in honor of Mozart. Typical Austrian foods such as Sachertorte (apricot & chocolate cake), Apfelstudel (Apple), Baumkuchen (layer cake), pretzels, Wiener Schnitzel (veal, not hotdog), Salzburger Nockerln (high calorie pastry) and Marillenknoedel (apricot dumpling). Combine the Austrian emphasis on pastry desserts with a cup of coffee at Afro Cafe, the terrace at the Hotel Stein, the “Rosthaus und Cafe 220 Grad” or the Republic. For a classic coffeehouse try Cafe Bazar, Cae Wernbacher or Cafe Fingerlos. Have some German Beer at Augustiner Braustubl or Stiegl-Brauwelt. Have a meal at Restaurant Goldener Hirsch, in the Hotel Goldener Hirsch. May to September are the best months to visit for comfortable Salzburg weather, but summer also brings rainy drizzly Salzburg weather. Expect average highs from May – September of 70 F (22 C) and lows of 50 F (10 C). The Alpine setting means that visiting in the winter is great for skiing. Salzburg airport is the gateway to the Austrian Alps. Average highs for December – February are just above freezing, while average lows are a few degrees below freezing. Rail is the best way to get to Salzburg. 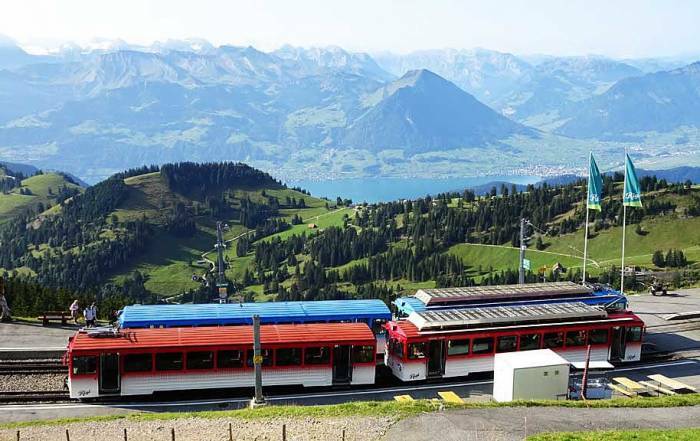 The Austrian Rail System (OBB) offers many ticket options for rail transport. 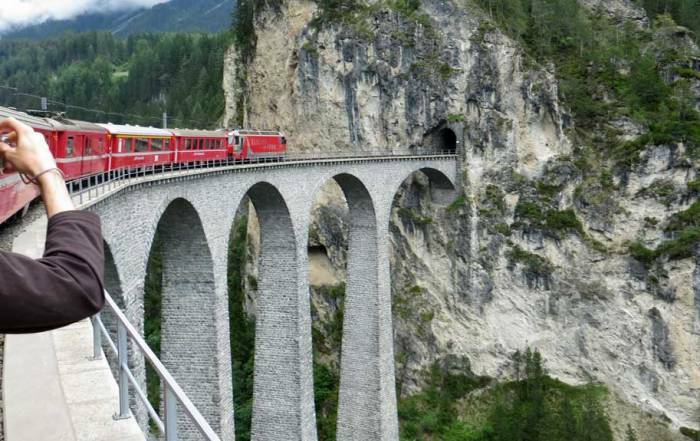 In addition to Eurail passes, Austria also has an Einfach-Raus ticket that offers single day rates for small groups. The Einfach-Raus ticket is similar to the Bayern Ticket in Germany. 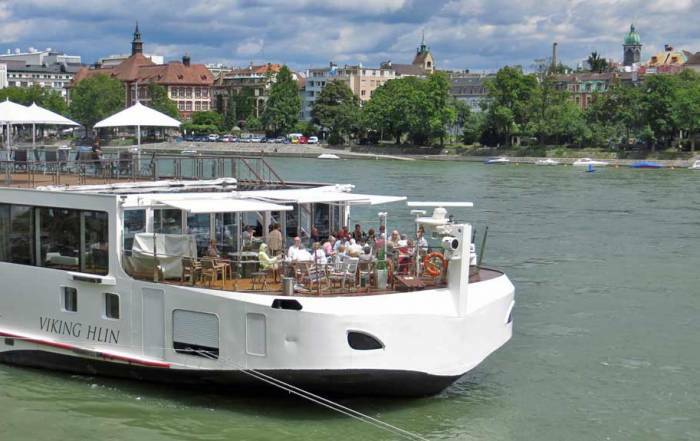 Another popular way to get to Salzburg is on a Danube River Cruise. 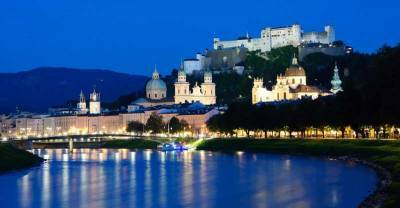 Many Danube River Cruises arrange day trips to Salzburg when they stop at Linz. The Salzburg Airport is not used very often by tourists because it is a smaller airport. The No 2 trolley connects the downtown railway station (Sazlburg Hbf) to the Salzburg airport. The Old and New Towns are located quite close together and each make good walking tours. Local buses are an excellent option to Hellbrunn Palace and for a day trip to Berchtesgaden. 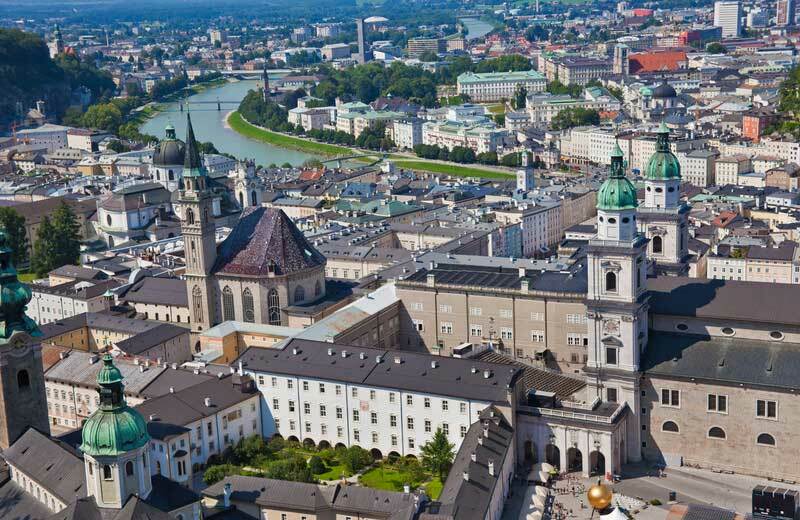 Almost 200,000 people live in Salzburg. The city is on the plains at the base of the Austrian Alps, near Munich, Germany. The name Salzburg means “salt town”, which refers to the many salt mines in the area. In the past, a major part of the economy was shipping salt down the Salzach River. Old Town Salzburg is a UNESCO World Heritage site. People here speak Austrian German and also an Austro-Bavarian dialect. Salzburg’s claim to fame according to its residents is that this is the birthplace of Mozart. 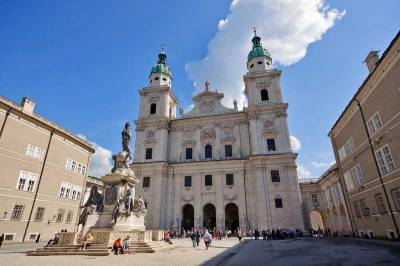 North American tourists, however, are more interested in its filming locations for the Sound of Music.